Over the years you have most likely accumulated many financial and investment products from multiple sources. The key to understanding the technical side of your financial portfolio is to take an inventory of the financial products and services you already own so that we can see if there are any gaps. This process starts with a documents checklist that includes your insurance documents, recent tax returns, brokerage statements, wills or trust documents, and your mortgage statements. Please bring copies of these documents with you to the Goal Setting Workshop. You may only have only one shot at retirement to get it right. Once you are retired, it may be impossible to go back to work and fix mistakes. How prepared are you? The 10 Minute Retirement Checklist for Pre-retirees and Retirees can reveal gaps in your retirement plan now, that can be addressed with professional advice from a Certified Financial Planner™ Practitioner at Hillebrand Financial Planning. Score yourself out of 30, and then call us for a complimentary planning session or telephone Q&A to shore up any gaps. Financial peace of mind comes from controlling what you can, so you worry less about what you cannot. This short 'right brain' white paper shows you the key infrastructure everyone needs to put in place to build wealth. Building wealth from 'where you are' using your current income stream is not guess work. Yet many successful couples make faulty assumptions about what they need to do to build adequate wealth before retirement. We are making this guide available to you as an introduction to our plan driven philosophy for building wealth. How to safely accumulate wealth, consolidate and protect gains, and make the best investment allocations in troubling times. 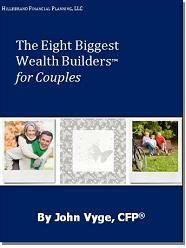 Contributing author John Vyge,CFP® now gives you chapter 80 & Chapter 27, which he authored, free for download. 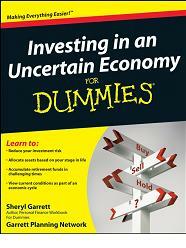 John was also a technical reviewer for 76 Tips for Investing in an Uncertain Economy For Canadians. For Dummies is the most widely recognized and highly regarded reference series in the world. Two of those chapters, are now available free for download.